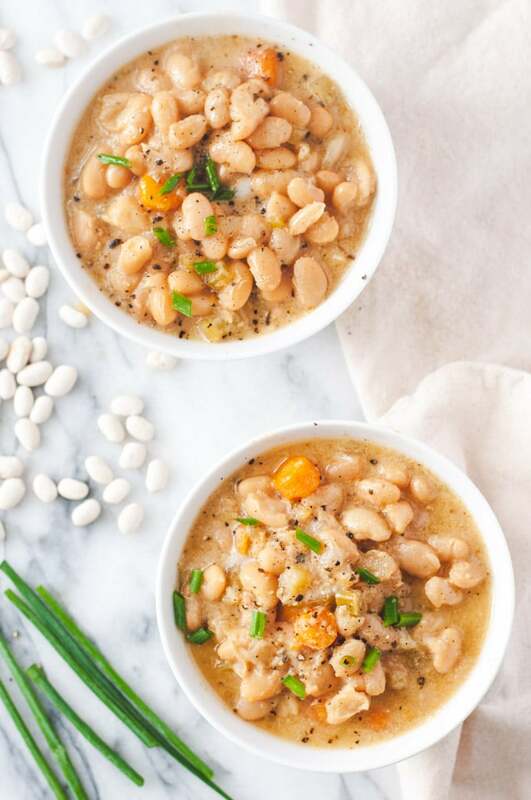 This creamy vegan white bean soup is a healthy and cozy soup made with dry great northern beans. No presoaking required; just add a few pantry staples to your Instant Pot and get excited for a comforting meal. 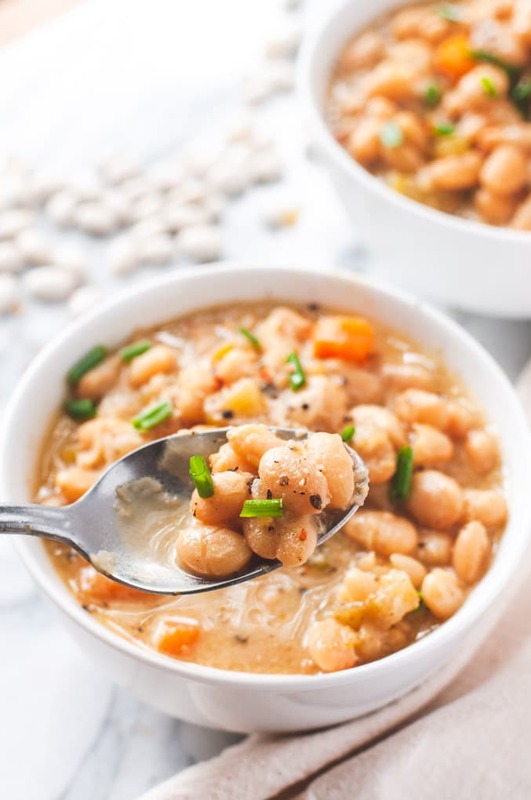 Cozy up and grab a bowl of this creamy vegan white bean soup because it’s officially soup season! What makes it officially soup season, you ask? Well, the average daily high is now less than 85 here in still-humid Georgia, which means there’s a chill in the air in the morning and you can walk outside without immediately sweating. And so soup season rushes in! I started my new full time job this week, and what a week it’s been. Between training, driving and working, I was not in any shape to prep for lunch this week. 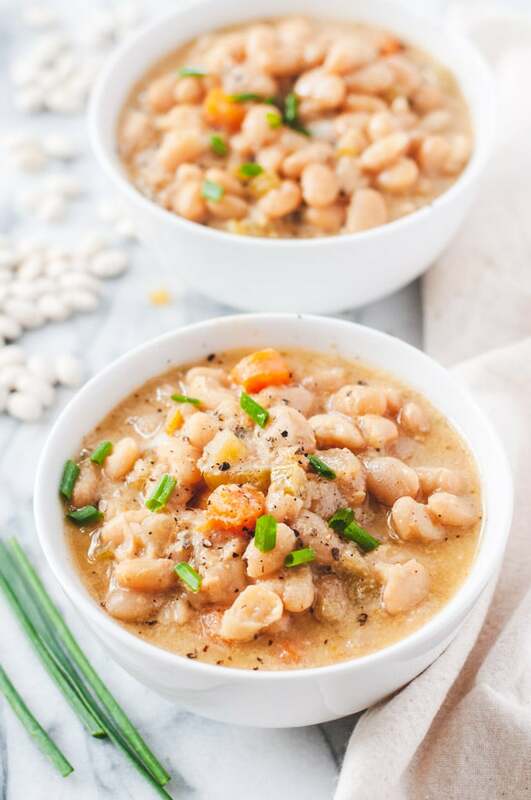 Thankfully I made this vegan white bean soup on Sunday and had enough leftovers to enjoy it for lunch through the week. 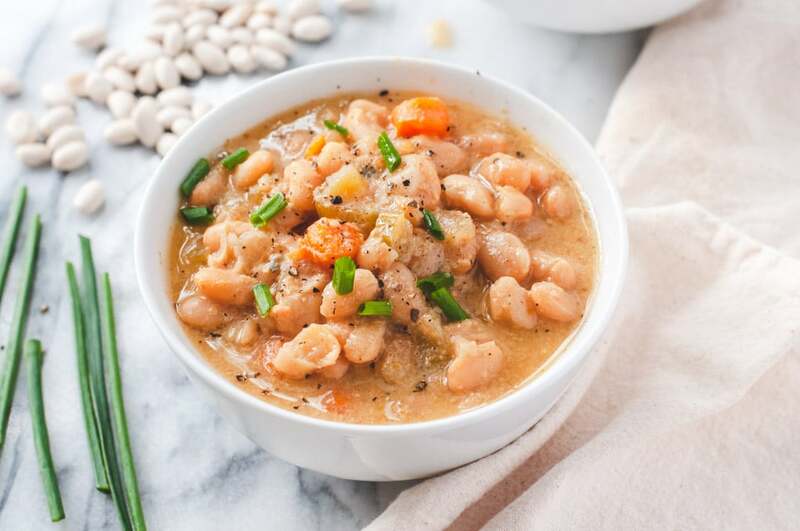 This vegan white bean soup is full of low-fat, plant based protein and fiber from great northern beans. Just one cup of cooked great northern beans provides 15 grams of protein and 12 grams of fiber – that’s half the daily recommend intake of fiber! 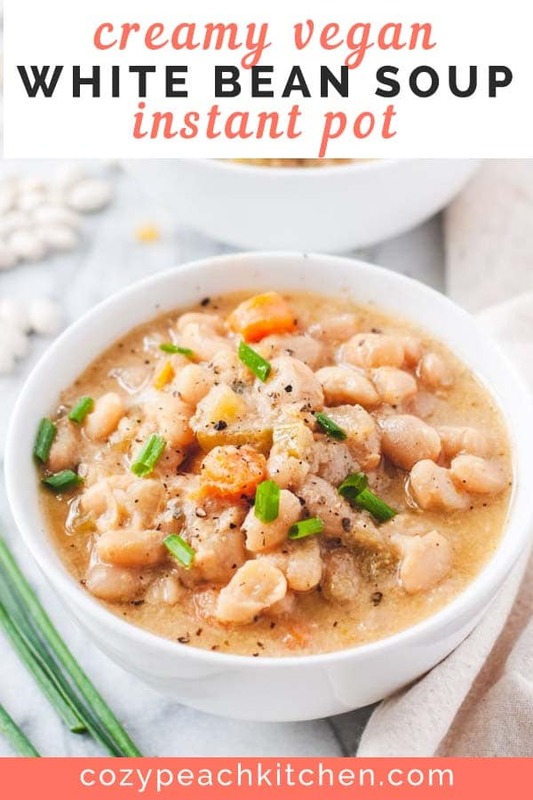 You can make this warming Instant Pot soup in just about an hour, most of which is hands-free. Start by sauteing onion, celery, and garlic in a bit of olive oil until aromatic and browned. Add in the spices, broth, non-dairy milk, rinsed white beans, and a dash more of oil. Give the soup a stir then lock on the lid and set the pressure valve to sealing. Cook on high pressure for 35 minutes. Allow the pressure to release naturally, which will take about 20 minutes. Give the soup a stir. Taste for salt and pepper. Enjoy! I like to add a tablespoon of nutritional yeast to creamy vegan soups because it adds a cheesey flavor and contributes to the creamy factor. Soy milk also adds creaminess, as it’s one of the “thicker” non-dairy milks. 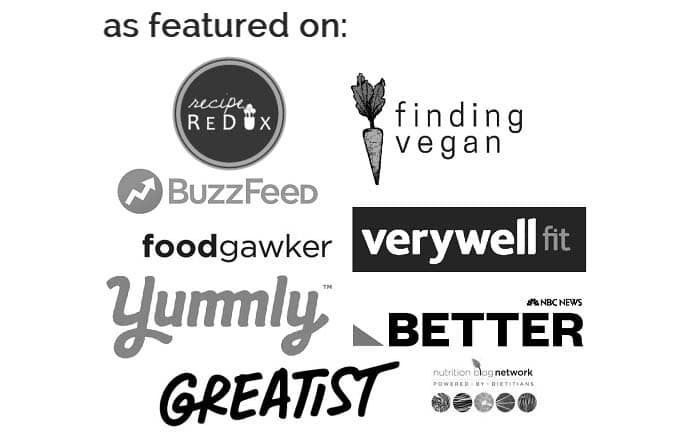 Looking for more cozy vegetarian soup recipes? Top with chives, fresh black pepper, and a few crunchy crackers. Enjoy! 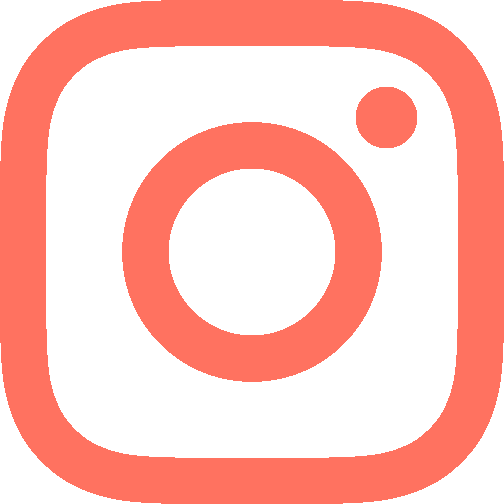 All of my Instant Pot recipes are made in a 6 qt DUO60 Instant Pot. 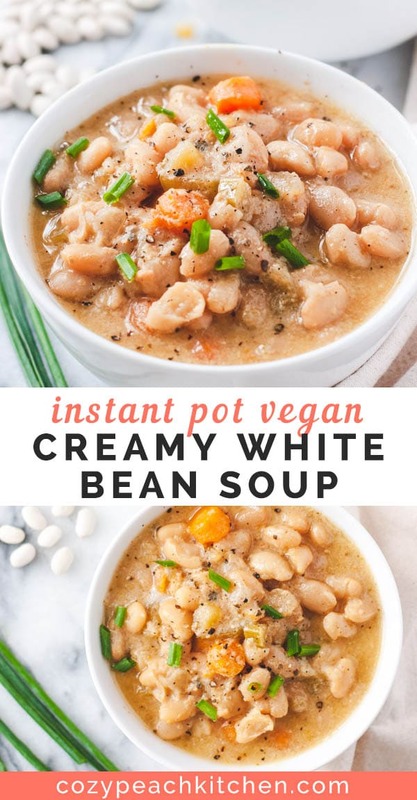 Check out more of my Instant Pot recipes here. 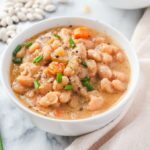 This healthy and warming vegan soup is made in an electric pressure cooker using dry great northern beans. Rinse great northern beans and remove any debris or shriveled beans. Add the oil to your Instant Pot. Press the "saute" function and adjust to "normal". Saute the onion, celery, and carrots until softened, about 5 minutes. Add the garlic and saute for 1 more minute. Add the seasonings, soy milk, and vegetable broth. Give the soup a stir to combine. Add extra teaspoon of oil (this prevents the beans from foaming and clogging the steam release valve). Lock the lid into place and set the pressure valve to "sealing". Press the "pressure cook" button; adjust to "high pressure". Set the cook time for 35 minutes. It will take about 15 minutes to come to pressure. Allow pressure to release naturally. This will take about 20 minutes; the pressure is fully released when the silver float valve floats down. Remove the lid carefully and give the soup a stir. Taste for salt and pepper. Enjoy! If the beans aren't as tender as you'd like you can reseal the lid and cook on high pressure for 5 more minutes (it will come to pressure quickly since it's already hot). Make sure to set the pressure valve back to sealing. Also note that older beans = longer cooking time (older beans are more likely to look wrinkly/shriveled, but otherwise you can't really tell until you cook them). 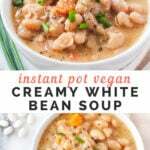 I use unsweetened soy milk to make this soup, as it's one of the more "creamy" non-dairy milks. You can try out unsweetened cashew milk or unsweetened oat milk if you're soy-free, though I haven't tried them myself. For a thicker soup, blend 1/3 of the soup in a blender or with an immersion blender. This makes it extra creamy! Enjoyed it! I left out the oil and it turned out great.